Meet at the visitor center which has restroom facilities. We will divide into smaller groups. Some will have longer areas to walk. Some trails will have roots and may be overgrown. There are no restaurants nearby. Contact David Shelley if you are able to help with this important count. You do not have to be an expert to help and may come for a whole or half day. This entry was posted in and tagged bathrooms at the meeting place, NABA Count, National Park, walk difficulty: easy, water fountain on September 14, 2019 by CBSAdmin. Meet at the visitor center which has restroom facilities. We will divide into smaller groups. Some will have longer areas to walk. Some trails will have roots and may be overgrown. There are no restaurants nearby. Contact David Shelley if you are able to help with this important count. You do not have to be an expert to help and you may come for a whole or half day. This entry was posted in and tagged NABA Count, National Park, public restrooms, walk difficulty: easy, water fountain on June 8, 2019 by CBSAdmin. I’m afraid we picked bad weather for our Saturday outing at Pilot Mountain. High temperatures are now predicted at 51 degrees, overcast and showers throughout the day Saturday. There are still plenty of Brown Elfins there, particularly on the Jomeokee trail. I again found no Henry’s Elfins but did have 18 Browns yesterday (4/18/19). Good luck on evading the upcoming storm! Meet at Parking Lot (at 10 AM) near the bathrooms (as far as one can drive up after entering the park). Pilot Mountain State Park has no entrance fee but does have cool drinking water and clean bathrooms! Please leave me your email address preferably or phone number if you plan to attend! This entry was posted in and tagged public restrooms, water fountain on April 20, 2019 by CBSAdmin. This entry was posted in and tagged National Park, public restrooms, walk difficulty: easy, water fountain on September 8, 2018 by CBSAdmin. Meet at the Silver Bluff Audubon Sanctuary at 9:00. There is a restroom facility and drinking fountain available before the count starts and again around noon during a lunch break. The nearest town with full services is Jackson, SC. It is recommended that you pack a lunch and snacks and bring water. Walking conditions are generally easy. Bring good bug spray, hats, sun block, binoculars, camera and a field guide. Wear long sleeves, long pants, sturdy shoes and any additional items you might need to have a pleasurable experience. Please refer to the Silver Bluff Audubon Sanctuary website, Audubon’s Silver Bluff Sanctuary, for more information about visiting the facility. Everyone is welcome to attend. We will divide into two groups if there are a sufficient number of participants so we can cover more of the Sanctuary. This entry was posted in and tagged Audubon Sanctuary, public restrooms, walk difficulty: easy, water fountain on July 7, 2018 by CBSAdmin. Meet up will be at the Visitor’s Center in the morning. This location offers a pleasant walk through stands of pine forests. Pathways are packed sand. Wearing sturdy walking or hiking shoes is recommended along with long sleeves and pants as we will go off trail in some locations to look for as many butterfly species as possible. It is recommended you use a good bug spray, wear sunscreen, and carry water with you. Be sure to bring with you those items you may need to have a pleasant experience. It is recommended you bring a packed lunch and snacks with plenty of water. The Visitor’s Center has public restrooms and a water fountain. The nearest towns of Aberdeen and Southern Pines have many restaurants and other accommodations. Target species for this count are the King’s and Edward’s Hairstreaks. 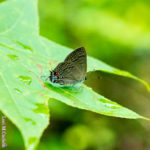 Additional species commonly seen are Palamedes, Spicebush, and Tiger Swallowtails; Common Buckeyes, Eastern Tailed Blues and Azures, and assorted duskywings. The results of last year’s count can be viewed here. This entry was posted in and tagged NABA Count, public restrooms, state park, walk difficulty: moderate, water fountain on June 6, 2018 by CBSAdmin. The Greensboro Arboretum is a long narrow 17-acre “island” located in the Lindley Park neighborhood. It has about 2 miles of trails and paths, most of which are paved. Meet just inside the entrance next to the Education Center. For information about the park, go to the following website: http://www.greensborobeautiful.org/gardens/greensboro_arboretum.php. Register here or contact the field trip coordinator, Don Allemann, dallemann@aol.com, if you plan to participate. Participants are welcome to come without contacting the coordinator, but you may miss us if there are last minute changes in the trip details. Trip coordinators will contact those who register with updates on weather issues, changes in timing or meeting places, and other details. We will explore several sections as time allows. Near the entrance to the arboretum are informal flowerbeds around a vine arbor that attract many butterflies and other pollinators. An adjacent small creek has milkweeds and other wild plants that usually are left un-mowed. This combination often draws butterflies to the park, especially if it has rained recently. A paved walkway will take a visitor several hundred yards along the creek to the official butterfly garden that is in the shape of two butterflies around a small pool. 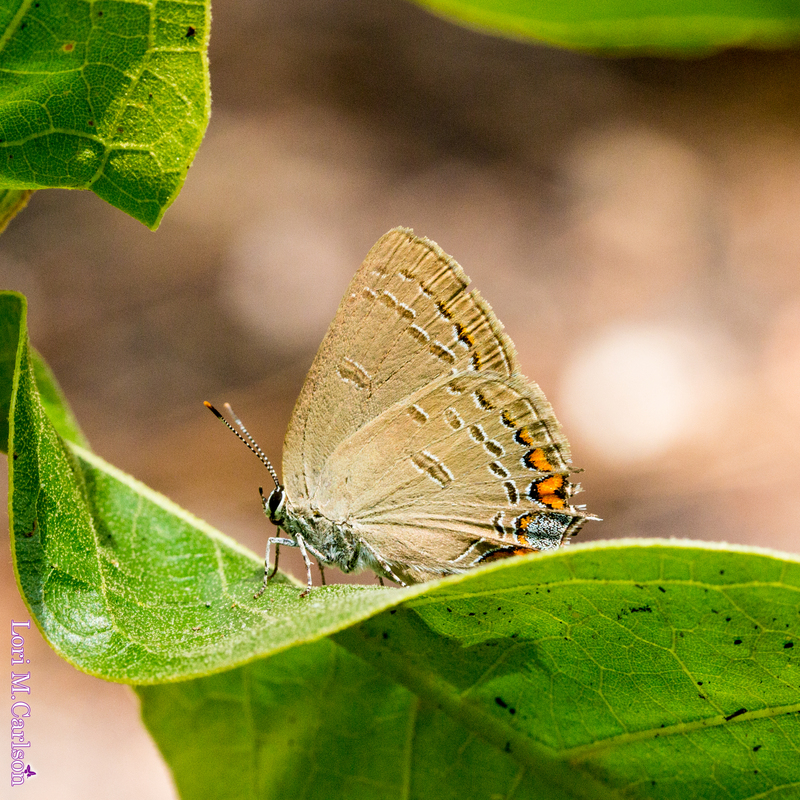 As trees have grown up around the garden, the site has become shaded part of the day so there may be more butterflies along the creek than actually are in the garden. This will be a fun butterfly walk for the more seasoned butterfliers, as well as butterfly photographers, beginners, and older children who are accompanied by an adult. Guests are welcome but no pets, please. This entry was posted in and tagged public restrooms, walk difficulty: easy, water fountain on May 19, 2018 by CBSAdmin. Participants are to provide their own transportation, meals, and lodging and all costs associated with this field trip. We will meet up at the Weymouth Woods Visitor’s Center. The Visitor’s Center has public restrooms and water fountain. It is recommended that you bring additional snacks, food, and beverages as during the walk we will be away from public facilities. After looking for the Yucca Giant Skipper at the off site location we will head to a few other sites in the area and work towards Sandhills Gamelands. You can pack a picnic lunch at Weymouth Woods or stop for lunch on the way to other locations. Wear long sleeves and pants, sturdy shoes or hiking footwear, and any other items you may require for a pleasant butterflying experience. The nearest city of Southern Pines offers many upscale restaurants in addition to fast food fare. Lodging accommodations are also available in Southern Pines. Road conditions in the Sandhills Gamelands can be tricky at times but we have not had issues recently. The roads are sand and are fairly solid but after wet weather can be difficult. Meeting time at second location will be determined the day of the event. This entry was posted in and tagged nature preserve, public restrooms, walk difficulty: easy, water fountain on April 14, 2018 by CBSAdmin. A wonderful citizen science opportunity for butterfliers! We will meet at the park’s visitor’s center. Transportation within the park to various locations will be provided. Amenities at the park include public bathrooms and water fountains within the visitor’s center. The nearest major city with restaurants and lodging is Elizabeth City, about 20 miles from the park. Be sure to bring with you the necessities you require to have an enjoyable butterfly counting experience. It is recommended that you wear long pants, long sleeves, bring insect repellent, and wear sturdy shoes or hiking footwear. Paths within the park are grassy and fairly level. Once inside the park conducting the count access to amenities is limited. The $3 participation fee for a NABA Count is waived. Please register for this event so that Brian can keep you updated about changes due to weather or other circumstances. 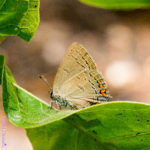 Target species is the Hessel’s Hairstreak. Additional butterflies to be observed include: Palamedes Swallowtail (a new state record number was observed in 2017), Zebra Swallowtail, assorted skippers, hairstreaks, and more. Review the trip report of the 2017 count. This entry was posted in and tagged free parking, NABA Count, public restrooms, state park, walk difficulty: moderate, water fountain on April 12, 2018 by CBSAdmin. Begin the butterfly season with a walk through the JC Raulston Arboretum! Meet up will be at the visitor’s center. Paths through the garden are easily navigated by any kind of footwear. Be sure to bring with you any necessities you might need to have an enjoyable walk. Amenities at the location include public restroom and water fountains. The arboretum is within driving distance of restaurants of all kinds. Parking is free. Butterflies typically seen at the Arboretum include: Tiger Swallowtails, Pipevine Swallowtails and caterpillars, cabbage whites, Sulphurs, assorted skippers, angelwings, and more! Rain date or poor butterflying weather reschedule date will be on April 11 @ 1-3 PM. This entry was posted in and tagged botanical garden, community outreach, free parking, plant sale, public restrooms, walk difficulty: easy, water fountain on April 11, 2018 by CBSAdmin.